"Let him who is without words throw the first stone.." I think that I need to practise a little stoning - that is creating stones - small pieces of writing that concentrate on something coming in through the senses. Here is a fuller description - Small Stones. I know that the challenge doesn't start until January 1, 2014, however, I'm at a loose end today and looking for a time waster or two, before I start some much needed housework. Stone #1. 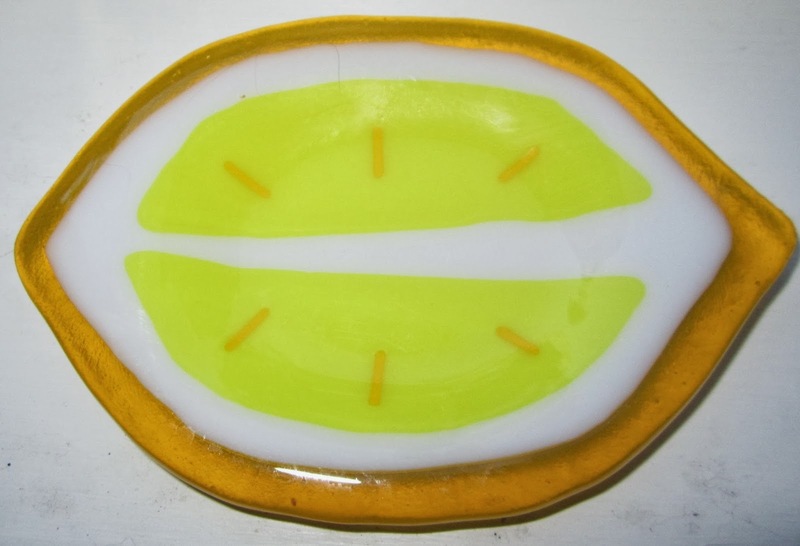 "Lemon and glass beam like a slice of sunshine." The picture is a small glass plate which a friend of mine gave me one Christmas as a gift. I needed one of those little plates that you rest a ladle or spoon on while cooking. Brenda remembered and brought me one that she found at a craft show. It makes me smile every time I see it. And I always think off her!! Stone #2. "Lemons, brilliant synthesizers of all that is bitter and sweet. 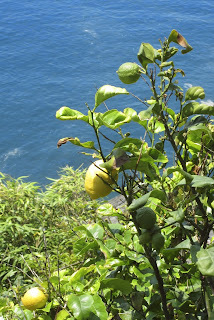 This lemon tree was on one of our walks in Cinque Terre, Italy. Each lemon was like a small drop of sunshine, just hanging there waiting to be picked. Stone #3. "Lemons, elixirs of taste! You are the rush of oyster, sting of shrimp, tang of soda - succulence in a squeeze. Now where is that broom?